Mr Gas is your boiler installation and service specialist as well as being able to provide boiler repairs in Brighton, Hove and surrounding areas. Formed in 1998, Mr Gas and the team have years of experience in the central heating industry, specialising in gas work, boiler installation, breakdown, servicing and repairs in Brighton, Hove and surrounding areas, within domestic and light commercial (up to 70KW) gas heating. We fit most makes of quality boilers including Vaillant, Worcester, Glow Worm and are happy to give a free estimate. With the latest training and fully qualified, polite staff, we provide a professional plumbing and heating service to domestic and light commercial customers. The service is designed to ensure that all current GAS SAFE regulations are adhered to. We can advise on energy efficiency within the home on your heating systems. 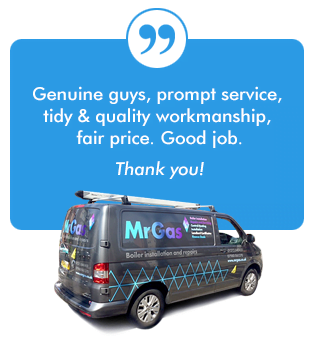 Mr Gas delivers bespoke heating services that are cost competitive and environmentally efficient. Our services include power flushing, landlord certificates, water tanks, cylinders, vented and unvented cylinders, solar, complete heating system installation and boiler breakdown, installation and repairs in Brighton, Hove and surrounding areas. All our waste is collected and recycled by a registered waste collection company. To find out more about our services including a boiler repair in Brighton, Hove and surrounding areas, please contact us today on 01273 725200.